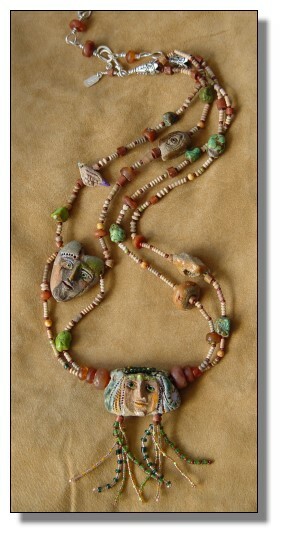 Width of woman's face bead: 1 3/4"
This necklace was designed around the remarkable handmade stoneware faces. Other stoneware beads include a little bird with a purple tail and unusual beads. Simple and sweet. LOVE BEADS: This piece includes "love beads," beads given to me after the fire by friends and strangers. The necklace carries the energy of their loving concern.